Thomas Sowell's The Vision Of The Anointed: Self-Congratulation As a Basis For Social Policy (1995) reminds me of the old saw: “Be careful what you wish for.” Sowell, a neoconservative, meant his treatise to be diatribe on the ineptitude of Liberals in government. However, what he really and inadvertently is writing about is Donald Trump as President of the United States. The United States with the election of Donald Trump, a businessman, as Commander-in-Chief has slyly or foolishly embarked upon World War III. There is no business as profitable as war especially in the twenty-first century where there is no military draft, however all young men 18, by law, must register at a Post Office for the military. With no military draft, our young people, only one-percent of the population, that will not be missed unless they are part of your family, are moved like pawn around the world to fight and die, or return home in chronic conditions. I'll call these military men and women the unmissed, while Trump calls them hero-warriors at their deaths. On the Trump's empire (Make America Great Again) war menu is the propaganda for War in the Middle East: Iran; and War in the Western Hemisphere: Venezuela; and China down the road if it refuses to cave like Japan. Iran is on the menu because of his promise to Sheldon Adelson to be “the best friend Israel ever had.” Venezuela because it, until the manipulation in Washington, was the most successful Socialist country outside of Cuba in the Western Hemisphere and it has a huge repository of petroleum. Socialism in South America cannot be abided, no matter how innocuous because it threatens Capitalism's imperialist nature. And China—must be subdued do to racism: it is a nation composed of peoples-of-color. If Trump continues on his course of Western Warlord, the United States will suffer from what Paul Kennedy in the Rise and Fall of the Great Powers calls “imperial overstretch.” This is because Trump has made enemies of allies/friends in NATO, and now names his bromance, Putin, his bête noir as violating the 1987 IMF missile treaty that may awaken a new arms race. In this mix, Trump himself, started a trade war with China, which threatens the economies of the entire world. However, Trump in his hubris, has convinced his allies, via war propaganda taken from Mein Kampf, to Regime Change in Venezuela and to unite in overthrowing the elected governor of Venezuela, Maduro, and replace him with a satrap Juan Guaidó as his choice. The Western imperialists have forgotten that the only long term successful-peaceful regime change was in South Africa with Mandela. Hubris determines that Vietnam or Iranian Revolution may be waiting in the wings. In his ignorance, Trump brags about the Treasury's wealth due to the tariffs—and refuses to understand that WE the American people are the ones paying the price for his trade and tariff wars with China, Canada and the EU. Wealth is usually needed to underpin military power, and military power is usually needed to acquire and protect wealth. If, however, too large a proportion of the state's resources is diverted from wealth creation and allocated instead to military purposes, then that is likely to lead to a weakening of national power over the longer term. In the same way, if a state overextends itself strategically it runs the risk that the potential benefits from external expansion may be outweighed by the great expense of it all. Great powers in relative decline [Make America Great Again] instinctively respond by spending more on “security,” and thereby divert potential resources from “investment” and compound their long-term dilemma. The United States and South Korea struck a hurried deal on the cost of the U.S. military presence, papering over a potential vulnerability in an upcoming U.S.-North Korean presidential summit later this month. Under the agreement, South Korea will contribute about $890 million a year for the U.S. military presence, an 8.2 percent increase from the previous five-year deal that expired at the end of last year. That's less than the billion dollars or more the U.S. had asked for. South Korea was already paying half of the cost of hosting United States Forces Korea, and the U.S. reportedly asked for a 50 percent increase or more. The deal still needs to be ratified by South Korean lawmakers before taking effect. 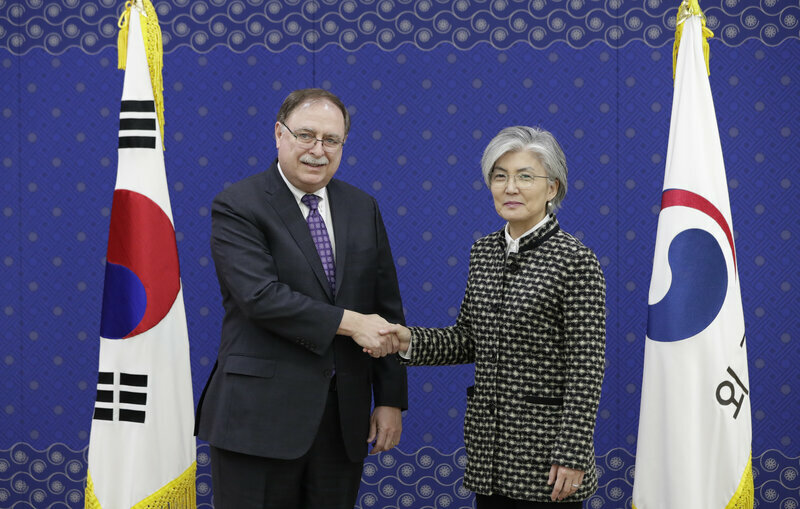 Seoul had sought a three-to-five-year agreement, but only got one, so it will have to return to the negotiating table with the U.S. in a matter of months. The Trump administration wants to strike similar deals with other allies who host large U.S. military bases, such as Japan and Germany, but South Korea's resistance could delay that, or make it more difficult. 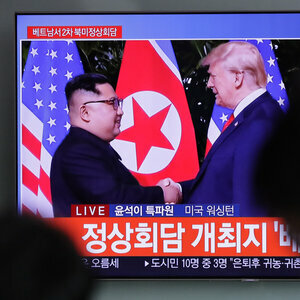 Some South Korean observers worry that this marks a shift from a "rules-based international order, to a deal-based order," said Chung Kuyoun, a political scientist at Kangwon National University in the city of Chuncheon. The U.S. insists that it was not considering pulling any of its 28,500 troops out of South Korea if its financial demands were not met. But it didn't really have to, as South Korean conservatives raised that possibility for them. "I regret that President Trump made the unilateral decision to suspend U.S.-South Korean joint military exercises during the first U.S.-North Korea summit in Singapore," said lawmaker Won Yoo-chul, in an interview in his office at the National Assembly in Seoul. "I am concerned that he may make a similar decision regarding the USFK in the second summit with North Korea," he added, using the initials for the forces in South Korea. Won, a member of the conservative Liberty Korea Party, represents the city of Pyongtaek, home to Osan Airbase, and Camp Humphreys, the largest U.S. military base outside the continental United States. Legislation passed last year prevents the president from reducing USFK strength below 20,000 troops. South Korea had resisted paying anything over a trillion won, or $890 million. Chung Kuyoun called the figure a "psychological limitation" for the South Korean public. "Given that the economy is pretty bad, and income inequality is increasing, and average wages is going down," she said, "paying more money for the military forces will become a political cost for the current administration." But ruling Democratic Party lawmaker Song Young-gil says, with the U.S.-North Korea summit looming, and with conservative lawmakers alarmed about a potential U.S. troop drawdown, Seoul was forced to go beyond the 1 trillion won threshold. Song said Seoul resorted to a plan B, which was the 8.2 percent increase, the same amount as South Korea's increase in its annual defense budget. 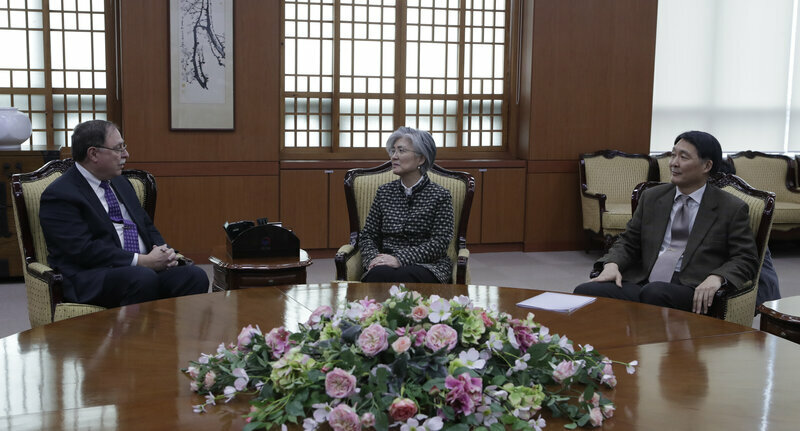 Song, who represents the port city of Incheon, argued in an interview that Seoul should be paying the U.S. less rather than more, because U.S. bases in South Korea exist not just for the defense of South Korea, but to protect U.S. global interests. "Camp Humphreys not only serves as a defense base against North Korea," he said. "It also serves to contain China and Russia, and to train U.S. forces deployed to the Middle East. So it makes no sense to call us freeloaders." He admits, though, that USFK contributes to a strategic balance of power in Asia which benefits South Korea. Song notes that the U.S. has also demanded cash payments for secure communication rooms on U.S. bases, known as Sensitive Compartmented Information Facilities, in addition to the formal cost-sharing agreement. The U.S. also wants Seoul to pay for the deployment of U.S. strategic assets, such as aircraft carriers and bombers, to the Korean peninsula. Besides covering logistics and construction costs, South Korea's contribution pays salaries for the roughly 8,700 South Korean employees of the USFK. Ten rounds of negotiations since last March failed to produce an agreement, and the U.S. threatened to furlough the South Korean workers without pay. But the employees who staff the U.S. bases could hardly just walk off the job, says Son Gi-o, an official with the trade union representing the workers. "If we stop working simply because wages are not paid," he said, "the work of the USFK would be paralyzed, and that could pose a critical threat to national security." Another union official, Choe Ung-sik, says that the U.S. negotiates Seoul's contribution based in part on the number of Korean employees it needs, but after getting the money from Seoul, the USFK then lays off some of those workers. "If the number of laborers declines but their wages remain," he asked, "where does the difference go?" Kennedy charges that there looms today a tension between a nation's search for strategic security and its search for economic security, which depends upon growth (which in-turn flows from new methods of production and wealth creation), upon increased output, and upon flourishing internal and external demand—all of which may be damaged by excessive spending upon armaments. A top-heavy military establishment may slow down the rate of economic growth and lead to a decline in the nation's share of world manufacturing output, and therefore wealth, and therefore power. His words of warning to the United States were therefore a conscious echo of those Victorian and Edwardian critics of British imperialism, who insisted that the cost of maintaining naval bases, colonial armies and subsidized governments across a vast proportion of the globe was higher than any economic benefits could justify. The same point has been made with the benefit of hindsight by number of economic historians, who argue that Britain could have enjoyed the advantages of free trade without the expense of formal empire; and, more importantly, that the money that taxpayers would have saved as a result of an Edwardian decolonization could have been spent on electricity, cars and consumer durable, thus encouraging industrial modernization at home. Although the Thomas Sowell is complaining about liberals, he is in reality predicting the coming of Donald Trump. Trump is a neoconservative dream: the anointed that would destroy Liberalism. But instead he is destroying conservatism and replacing it with fascism.